The Opt Out movement and resistance to high-stakes testing continued to expand and grow in Chicago over the last weekend in February 2014 with forums and discussions at different locations and telephone organizing taking place across the city. 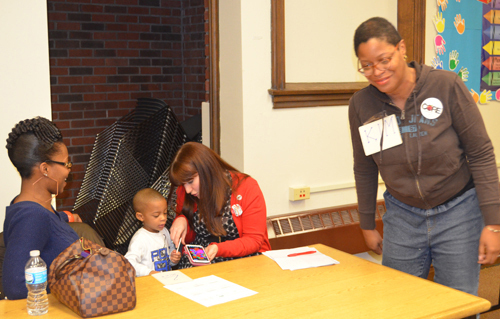 In order to share their organizing methods to opt out of CPS�s harmful testing program, Chicagoans from the northwest, southwest, and southeast sides of the city met together at CORE�s �Too Many Tests� forum at the South Shore library on February 22, 2014. 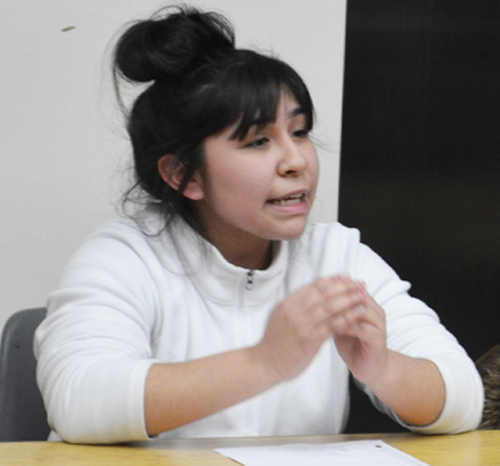 One of the students from Saucedo Elementary School who will be opting out of the ISAT in March 2014 spoke at the February 22 forum at the South Shore library. Substance photo by Sharon Schmidt.Parents, teachers and students from across the city came to the event to share their experiences in building that movement. At Saucedo elementary school, the combined efforts of teachers, parents, and students � handing out literature, speaking at the LSC meeting, and sharing information with friends �created much momentum for opting out of the ISAT, Saucedo teacher (and CORE co-chair) Sarah Chambers reported. The ISAT is the Illiinois State Achievement Test. Information meetings are planned at the school for Tuesday, February 25, in both the morning and afternoon. CORE�s Kim Bowsky led the event that included testimony from panelists and participants on the harmful affects of standardized testing, particularly on Chicago�s minority students. Katie Osgood, a special education teacher working in a therapeutic hospital in Chicago, spoke about how testing is pushing students to frustration resulting in panic attacks, aggressive behavior, and other indications that they are being traumatized. Testing is adding trauma to a population in CPS that already experiences much stress, she said. Panelists at the February 22 Out Out forum at South Shore library. Substance photo by Sharon Schmidt.Teacher and researcher Monique Redeaux, as well as others in the room, discussed the bias in standardized tests against minority students, and the use of tests to keep students in the status quo. A grass roots movement to opt out of testing is growing. Increasingly, parents are opting out their children from this year�s ISAT, thanks to the More Than A Score Chicago �Ice the ISAT� campaign and efforts of CORE. This is the last year the ISAT will be administered in Chicago, and CPS officials have been unable to give parents, teaches and students a coherent explanation of why an entire week of school will be taken up with the ISAT in March 2014. Unlike past years, the ISAT will no longer have high-stakes attached. CPS is not using the test score for its summer school/grade promotion criteria in the 3rd, 6th, and 8th grade as it has in the past. It is not using the scores of 5th and 7th graders for selective enrollment programs. CPS has informed schools and parents that it will use the spring NWEA MAP test scores for grade promotion and selective enrollment programs this year. At the CORE forum, participants planned for increased organizing for opt out as well as additional teacher actions. Teachers discussed boycotting the NWEA MAP tests and the PARCC tests planned for next year.